The Virgin Mary who conceived by the Holy Spirit encounters her cousin Elizabeth who has miraculously conceived a child in her old age. John the Baptist leaps for joy in Elizabeth’s womb at the encounter with Jesus in Mary’s womb. Filled with the Holy Spirit, Elizabeth recognizes the tiny unborn Jesus as her Lord. 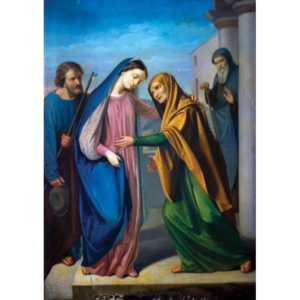 Imagine Mary’s joy at this encounter confirming that nothing is impossible for God and at having her cousin share at least partially in the secret thus far known only to her and Joseph. With Mary and Joseph, Elizabeth and Zechariah, let your soul also glorify the Lord and humbly recognize his saving love for you. Mary, full of grace, and Joseph, son of David; honor to you, Mother of God, and to you, guardian of the Redeemer. Eternal praise to the child with whom you formed a family, Jesus the Lord.